I have minor lower back pain. In the past, I've tried to get relief through exercises and stretches (learned from a Physical Therapist). Even though the stretches help, it requires a daily commitment to stay stretched out. It only takes a couple of days without stretching for the lower back pain to return. I wanted to get to the root cause of the pain. Browsing on Amazon, there are many categories of products designed to help with back pain. Since I end up sitting a lot during my day job, many chair and desk ergonomic evaluations focus on chair lumbar support. And apparently that wasn't helping. For that reason, I wasn't interested in another lumbar support product. Instead, I focused on a cushion that is designed to relieve back pain. It looked to be highly reviewed, and for between $20 to $40 was well worth it if it could alleviate some of the pain. As it turns out, it solved all my lower back pain problems! What to Look for in a Seat Cushion for Lower Back Pain? U-Shape Design, where the top of the U that's open is positioned near the back. I believe the opening near the back is to alleviate pressure on the tailbone. Removable cover, because you're going to want to wash it from time to time. High Reviews on Amazon, but if there's any sign of reviews from customers who received the pillow for free, steer clear! Make sure the pillow is memory foam, otherwise it may compress faster than other pillows. I've been using mine for over 2 months and it's still going strong! For reference, I'm around 170 pounds. How difficult could using a seat cushion be? But some things that I noticed I wasn't able to do when the seat cushion was on the chair is sit with one leg on the chair or cross legged. Though I would never sit like that at the office in a professional setting, I like to unwind and sit a bit more relaxed when at home (which is where this seat cushion was originally purchased for). Other than that, the first time you sit down, it may feel a bit uncomfortable. But don't give up. After sitting in it for a couple of days, it becomes normal. And you'll be pleasantly surprised at how much it may help your back. There's not much to dislike about this pillow. And though everyone's source of pain may be different, $40 is worth it for your health. That's almost the price of a co-pay to visit the doctor or the countless trips you'll have to make to visit a physical therapist. And unlike exercise and stretching (which is still good and you should do daily), this seat cushion really gets at the root of the problem. 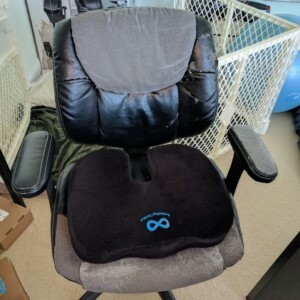 Now that this seat cushion was solved my back problems, my best guess (I'm not a doctor) is that I was using an older chair with worn out cushions. That being the case, ordering a "topper" seat cushion is far cheaper than purchasing a new chair. In fact, I like this solution so much I'm tempted in having one ordered for my work chair.